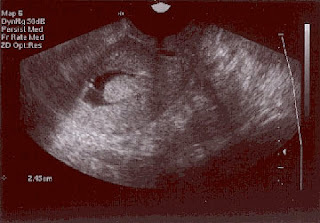 The aggressive superovulation worked, and the Day 10 scan showed she had 4 mature follicles . However, this scan also showed she had a small 0.5 cm size polyp in the uterus. This was an unexpected finding, as the Day 3 check scan we had done for her before we started her superovulation showed her uterine lining was normal. Polyps are benign finger-like growths found in the uterine lining. They occur because of a localised growth of endometrial tissue; and since they are estrogen dependent , they grow in size as the estrogen levels rise. How polyps affect fertility is still unclear because it is quite common to find polyps in healthy young fertile women as well . However, a concern is that large polyps may prevent embryo implantation, because they may act as a foreign body. The truth is that we still do not understand the natural history of polyps. It is quite possible that lots of fertile women have small polyps ; and because these do not interfere with pregnancy , they are never detected. IVF specialists tend to treat every abnormality we see. Since we see only infertile patients, we often assume that every problem we see must be contributing to the infertility - which is why it must be "corrected". Sometimes these "abnormalities" are just incidental findings of no clinical importance; and we may sometimes end up overtreating our patients, in our enthusiasm to diagnose and treat abnormalities. I discussed her options with her. If she had had lots of eggs, one option would have been to go ahead with the egg collection; to freeze all her embryos; and then , in the next cycle, do a hysteroscopy with polyp removal , and then transfer the frozen embryos after thawing them. However, this was not a very good option for her since she had only a few eggs and there was a risk that we may not have many embryos to freeze , which meant that there was a possibility that her frozen embryos would not survive the thaw. We finally decided to go ahead with the egg retrieval and the embryo transfer ; and keep our fingers crossed and hope for the best. Of course, if she gets pregnant, we'll all be very pleased we made the right decision ! If she does not get pregnant, we may kick ourself for not removing the polyp ( even though this may not have any impact at all on her chances of success). Life can be hard when we do not have enough evidence to make the right decision - but medicine is a messy biological science, and sometimes we just need to make the best of a bad deal ! Will IVF cause me to run out of eggs ? The Health Care Blog: Gimme My Damn Data! Is is possible to improve ovarian reserve ?